James Brown was really not a nice guy, but he was entertaining as hell. 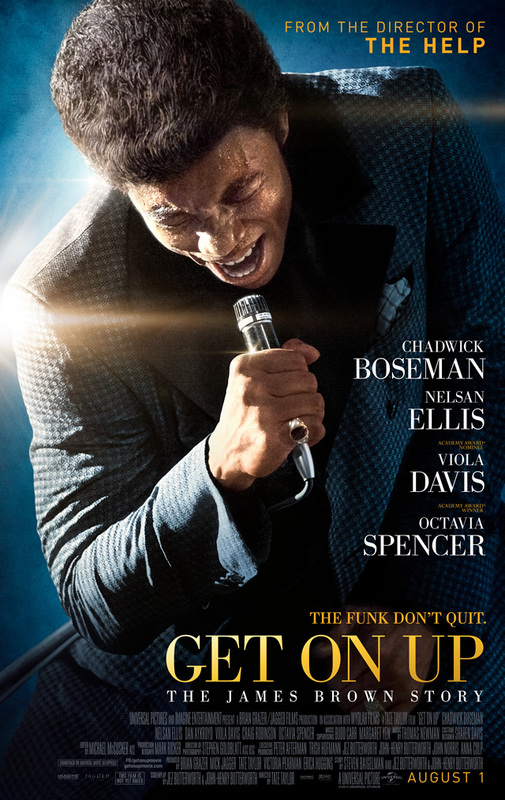 That’s what I took away from Director Tate Taylor’s biopic, Get on Up, featuring a star-making turn by Chadwick Boseman as Brown. Get on Up tells the Godfather of Soul’s life story from childhood to the early 1990s, but it focuses mainly on the sixties. While the film centers on Brown’s professional life, it doesn’t shy away from the darker moments of his personal one. It also doesn’t delve too deeply into them either. Taylor, along with screenwriters Jez and John-Henry Butterworth, employs a non-linear approach to the story, hopping all over Brown’s timeline. All the jumping around can get disorienting at times, but I was able to follow along fairly well. There were only a couple of instances when I didn’t know what time period we were in. Also, most biopics like this have a specific framing device—usually addiction—but with Get on Up, the framing device is Brown himself, so the film’s focus feels all over the place. At the same time, though, that doesn’t detract from the audience’s enjoyment of the film. It’s a dynamite piece of work, using Brown’s sterling catalog of hits to maximum effect—all the music is pre-recorded; Boseman doesn’t do any of the singing. The main elements of Brown’s life that keep popping up throughout the film include the effect of first his mother (Viola Davis) and later his father (Lennie James) abandoning him. Brown, who is played as a child by Jamarion and Jordan Scott, is left with his aunt (Octavia Spencer) and raised in a brothel. After stealing a suit in his teens, he is imprisoned and has a chance encounter with Bobby Byrd (Nelsan Ellis), a musician entertaining the prisoners. The two are kindred spirits and Byrd takes Brown in so that he can make parole. Soon enough, Brown’s outstanding musical talent and genius is revealed and he takes over Byrd’s group, renaming them The Famous Flames. They are discovered by record producer Ralph Bass (Josh Hopkins) and the label they sign to quickly pegs Brown as the star, marginalizing the other members of the group. Brown is teamed up with agent Ben Bart (Dan Aykroyd), forming another important relationship in Brown’s life, and the rest is history. It was amazing to watch the effect fame had on James Brown. It changed him from a nice kid to an egotistical jerk, and the movie doesn’t hide that. He alienated a lot of people, but as Byrd points out, “he’s a genius.” Brown was a highly controlling man, who wanted everything in his life a certain way. He would famously fine the musicians in his band if they made mistakes or talked to him a certain way. He was a powerful personality and it completely went to his head. His history of domestic abuse is kind of glossed over in a single scene with his second wife (Jill Scott), but one of several fourth-wall-breaking moments showed that Brown was ashamed of hitting her. It was definitely a case of a picture telling the whole story. The breaking of the fourth wall is used much better here than in Clint Eastwood’s Jersey Boys, another musical biopic from earlier this summer. It just seemed to flow much better in this film. The main source of abuse featured in the film is the constant verbal abuse that Brown dished out to the people around him when things didn’t go his way. The success of Get on Up is based completely on the performance of Chadwick Boseman as James Brown and he is absolutely amazing. Boseman did a great job as Jackie Robinson in his breakout performance in 42, but his performance in Get on Up is destined to make him a star. He perfectly captures Brown’s moves on stage as well as his voice. There is no amount of hyperbole too great to describe how impressed I was with Boseman’s performance. To my eyes, he should be a lock for an Oscar nomination. Nelsan Ellis is also fantastic as Bobby Byrd, Brown’s oldest and longest-suffering friend, who stuck with Brown through thick and thin, but still didn’t escape his abuse and ridiculous demands, which ultimately led to their falling out. The rest of the cast is also really good, but Boseman and Ellis carry the show. Craig Robinson has some funny scenes as one of Brown’s musicians, Maceo Parker and Aykroyd does really well as Bart, the only man to stick with Brown all the way to the end, but that’s what happens when you’re making money. Also watch out for Brandon Smith as Little Richard. He’s not in the film long, but he definitely makes an impression on both the audience and Brown. Overall, Get on Up is not a perfect film, but it is perfectly entertaining. Chadwick Boseman brings James Brown back to life and carries the film with confidence and panache. Brown’s music is just as great today as it was back when he recorded it and Tate Taylor has done an excellent job of melding the drama with the music to tell a compelling story.